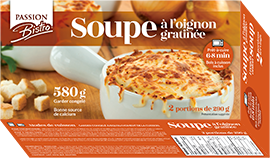 An explosion of flavour, this French onion soup with a tasty broth will heat up spirits at your next dinner party. As comforting as it is nourishing, this soup is generously filled with onions and croutons, and covered with real melted Swiss and mozzarella cheeses. Have even more time to enjoy your guests, thanks to this ready-to-cook soup. For a home-style presentation, transfer the frozen soup into a ceramic bowl and follow the oven cooking instructions. Keep the soup frozen until use. Cooking time may vary from one oven to the next. Cooked French onion soup will be hot. Handle with care. Let sit for 5 minutes before serving. The product is ready when its internal temperature reaches 165 °F (74 °C). Preheat the oven to 375 °F (190 °C). Remove the soup from its box and remove the plastic film covering the cooking bowl. Cook in the cooking bowl on the centre rack for 40 minutes or until the cheese is golden brown. Remove the soup from its box and peel back a third of the plastic film covering the cooking bowl to let the steam out. Place the cooking bowl directly in the microwave oven. Cook on high for 5 minutes. Remove the plastic film entirely and stir. Cook 2‒3 more minutes. The cooking bowl will be hot. Handle with care. Please note that microwave cooking mixes the cheese into the soup. 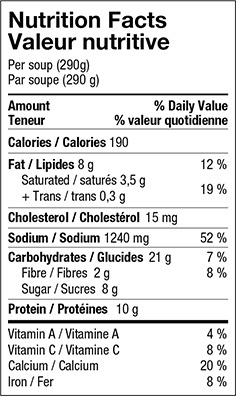 Broth: water, onion, sugar, canola oil, hydrolysed soy and corn proteins, dehydrated onion, yeast extract, salt, yeast, flavour, modified milk ingredients, spices, caramel, dried cheese extract, flavour (soy lecithin). Topping: partly skimmed mozzarella and Swiss cheeses (partly skimmed pasteurized milk, modified milk ingredients, bacterial culture, salt, calcium chloride, microbial enzyme, cellulose, natamycin, beta-carotene), croutons (wheat flour, sugar, canola oil, yeast, modified palm oil, salt, soy lecithin, ascorbic acid), parmesan cheese (pasteurized milk, modified milk ingredients, salt, powdered cellulose, lipase, microbial enzyme, bacterial culture, natamycin). Contains: milk, soy, wheat, sulfites. Passion de la Mer is a prime maker of ready-to-cook meals showcasing quality fish and seafood. Together, let’s share the passion!